Interstate 66 links Washington, DC with Interstate 81 near Front Royal, Virginia. 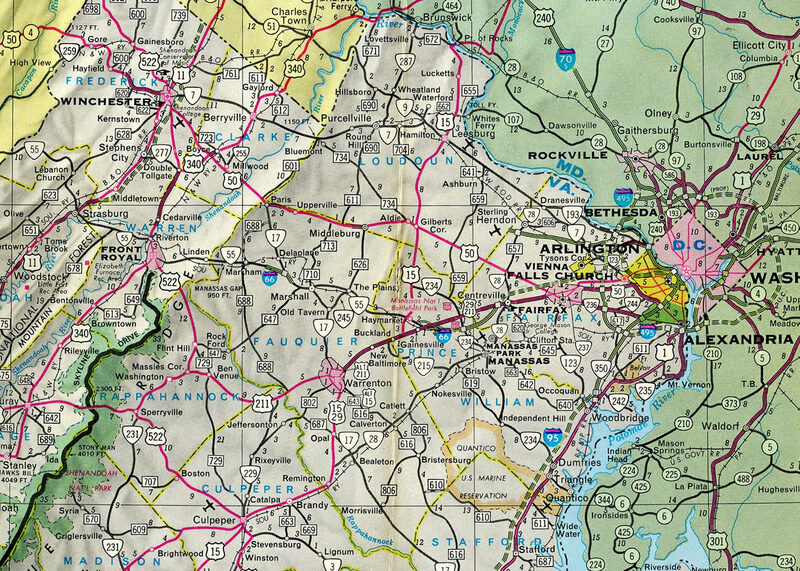 The freeway serves commuter interests from Washington D.C. west to the growing Northern Virginia suburbs of Centerville, Manassas and Gainesville. The westernmost extent is both rural and scenic. Originally I-66 was planned to connect to the planned alignment of Interstate 95 through Washington. It instead ends almost immediately after entering the District of Columbia at the Whitehurst Freeway (U.S. 29). After crossing the Potomac River via the Theodore Roosevelt Bridge, Interstate 66 meets the Potomac River Freeway where it turns northward along side the John F. Kennedy Center for the Performing Arts and the Watergate complex. 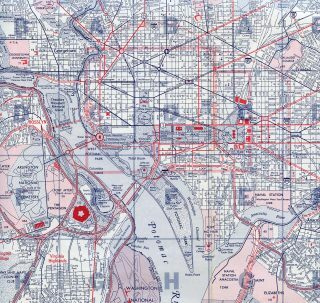 The Potomac River Freeway, a short freeway between the Roosevelt Bridge and U.S. 29 (Whitehurst Freeway), was planned as a much longer route linking the unconstructed Southwest Freeway (I-695) with Interstate 270. I-66 ends with ramps to Rock Creek Parkway and U.S. 29 south while the westbound beginning is accessible from the Whitehurst Freeway east and 27th Street NW. Proposed Interstate 66 from Kansas to Kentucky is part of High Priority Corridor 3: TransAmerica Corridor. Its designation is written into law for the portion that travels through Kentucky. 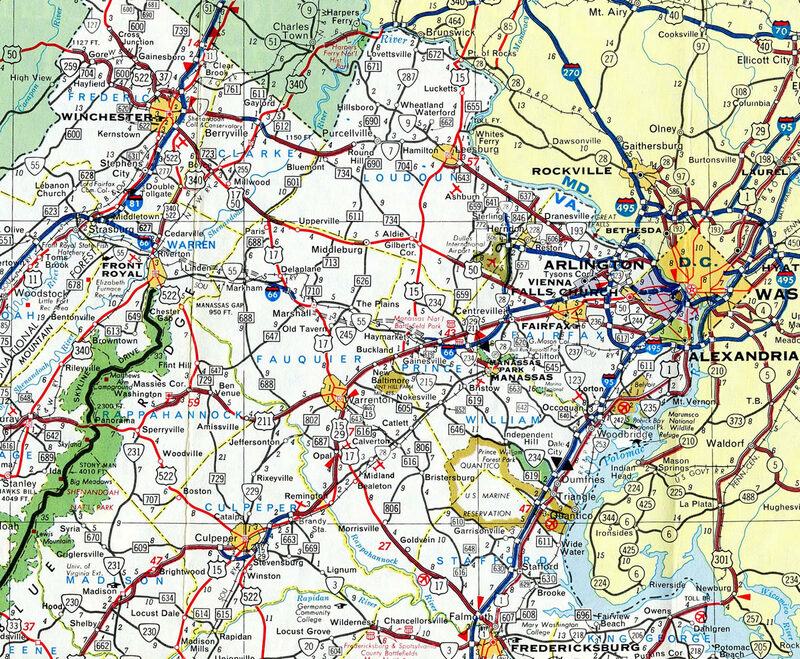 Interstate 66 largely parallels or replaced U.S. 211 between Interstate 81 and Washington, D.C. U.S. 29 mirrors the freeway east through Arlington to the Francis Scott Key Bridge into Georgetown in Washington. 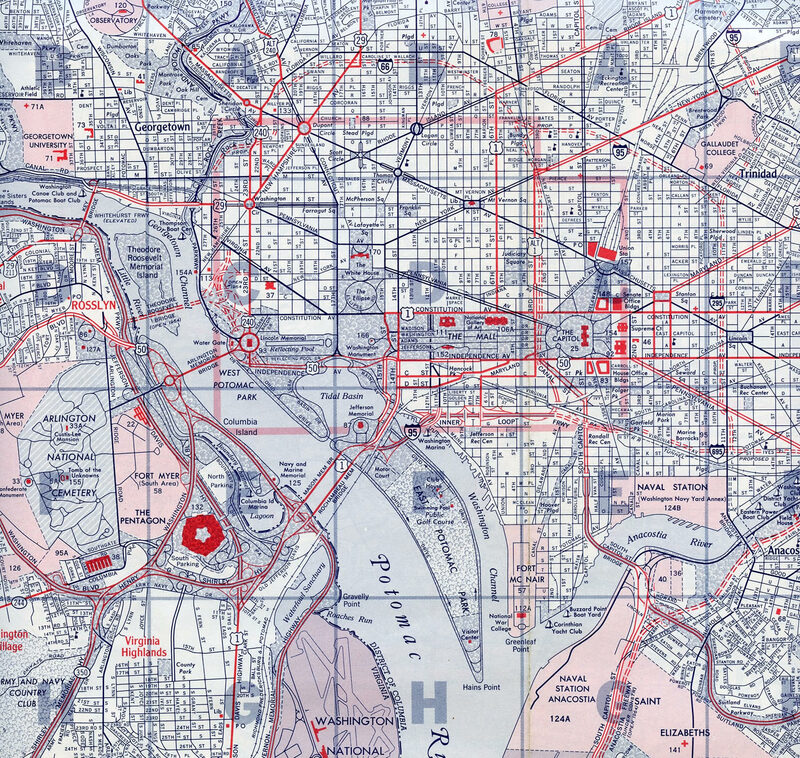 U.S. 50 overlaps with the route across the Potomac River between Arlington Boulevard and Constitution Avenue. The Interstate 66 East-West Trans-America Freeway was an idea hatched by Wichita business people in the early 1990s as a means to bring more business to southern Kansas. Interstate 66 was envisioned to connect Fresno, California, with Washington, D.C., via the Four Corners, Wichita and the width of Kentucky. They saw the business that Interstate 40 and Interstate 70 brought along their respective corridors, and felt southern Kansas should have that kind of business too. Capitalizing on the fabled number “66,” they determined that a new, coast-to-coast route would bring Kansas additional business. So the businessmen brought the idea to their politicians, and the politicians managed to get the idea listed as an ISTEA high priority corridor. Included with that congressional act was funding for a million dollar feasibility study. Unrealized plans called for an extension of Interstate 66 westward along a rough routing determined between Interstate 55 in Missouri and proposed Interstates 73 & 74 and U.S. 52 in West Virginia. Added as a high priority corridor in 1991 and amended in subsequent transportation bills, Interstate 66 is the generally accepted designation for Corridor 3. The Fiscal Year 2002 Transportation Appropriations Bill added I-66 as an Interstate Highway in the state of Kentucky. The legislation facilitated adding new mileage to the route, but construction did not follow. The 2004 official map of Kentucky showed the anticipated corridor of the route. Future corridor signage for I-66 was erected on eligible sections of the Cumberland (Louis Nunn) Parkway on March 23, 2005 (To see this signage, visit Jeff Carlyle’s Kentucky Roads page.) as part of the planned route between Paducah and Pikeville, Kentucky. This future designation was authorized in the December 2001 Transportation Appropriations Bill for Fiscal Year 2002, with $22.5 million allocated to Interstate 66. The Cumberland Parkway was already Interstate compatible. All that was required was eliminating the cloverleaf interchanges at the former toll booth locations at the U.S. 127 and U.S. 68 exits. East of Interstate 75, the Interstate 66 corridor is proposed to follow the Hal Rogers Parkway east to Exit 56 (Kentucky 451). Hal Rogers Parkway is a Super Two with passing lanes on the hills. Extensive reconstruction is needed to become Interstate compatible. Currently, there is no freeway connector between the Cumberland and Hal Rogers Parkways, so one will have to be constructed. The section of proposed Interstate 66 through Kentucky previously had a proponent web page at http://www.interstate66.com/ – Interstate 66: TransAmerica Corridor (by the Kentucky Transportation Cabinet). East across the hills of eastern Kentucky, the I-66 corridor is projected to cross into West Virginia between Matewan and Edgarton. It is to end at the proposed King Coal Highway (Interstates 73 & 74) in West Virginia. It is unclear how Interstate 66 in southwest West Virginia would connect to Interstate 66 in Virginia. While this could be accomplished through U.S. 119 and U.S. 48/Corridor H via Charleston, it is not known if this is being considered. Corridor H in northeast West Virginia is partially built as a four-lane divided highway, but without full access control. 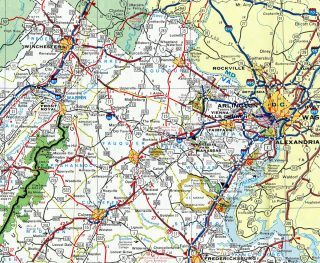 Interstate 66, from Interstate 495 (Capital Beltway) east to Washington, D.C., was approved for federal funding on January 5, 1977, by Secretary of Transportation William T. Coleman, Jr. The freeway was built with four lanes and had truck restrictions. Additional restrictions were in place during commuting hours: cars with four or more occupants, buses, airport traffic, and emergency vehicles. The final section of Interstate 66 within the beltway opened to traffic on December 22, 1982. The Theodore Roosevelt Bridge, which carries I-66 from Arlington, Virginia, east into the District of Columbia, opened to traffic on June 23, 1964.2 See Scott Kozel’s Roads to the Future web site for a detailed history of Interstate 66 across the Commonwealth of Virginia. Interstate 66 travels just a 1.5 miles in D.C. on a shortened alignment north to K Street (U.S. 29) near George Washington University. The freeway was planned to continue northward along Rock Creek to Massachusetts Avenue, where it would turn eastward parallel to Florida Avenue and U Street. The route was proposed to arc southeast from 11th Street to end at Interstate 95 where 14th and P Streets intersect. This portion, and the northern extension of the Center Leg Freeway (I-95) were withdrawn from the Interstate system when all unbuilt sections of the D.C. freeway network were canceled in 1977. In addition to the cancellation of I-66 north of K Street, the Center Leg Freeway was unconstructed north of New York Avenue (U.S. 60), Interstate 295 north of the Southeast Freeway was unbuilt, and all of I-95 between I-66 and the Capital Beltway was canceled. West End (Whitehurst Freeway) – Washington, D.C. The last reference for Interstate 66 appears at the split with U.S. 50 at the east end of the Theodore Roosevelt Bridge. U.S. 50 joins Constitution Avenue NW east along the National Mall. Photo taken 08/04/13. Interstate 66 turns northward onto the Potomac Freeway, next entering a directional T interchange with the E Street Expressway. Photo taken 08/04/13. The Potomac Freeway passes through a cut and cover tunnel below Virginia Avenue NW and New Hampshire Avenue NW east of the Watergate Complex. Photo taken 08/04/13. Interstate 66 partitions beyond the tunnel into ramps for 27th Street SW, the Whitehurst Freeway (U.S. 29) and L Street NW to K Street NW (U.S. 29). Photo taken 08/04/13. Additional coverage of the Interstate 66 eastern terminus posted at Interstate 66 D.C. guide on AARoads. The Whitehurst Freeway travels east from the Francis Scott Key Bridge to a wye interchange with Interstate 66 (Potomac Freeway) west. Photo taken 08/04/13. U.S. 29 joins K Street east from the Whitehurst Freeway end as I-66 begins to the south. Photo taken 08/04/13. The Potomac Freeway emerges from a cut and cover tunnel below Triangle Park and separates with Interstate 66 west at the E Street Expressway. The Potomac Freeway spurs south to Ohio Drive SW. The plywood concealing the overhead here concealed a sign for Interstate 695 south, the unconstruced Southwest Freeway that would have linked I-66 with I-395 (then I-95). Photo taken 08/04/13. More photos covering U.S. 29 north ahead of the split with Interstate 66 posted at the U.S. Route 29 D.C. page on AARoads. Little North Mountain rises along the western horizon as Interstate 66 advances to within two miles of Exits 1A/B with Interstate 81. The northbound control city of Winchester is just 16 miles away while the West Virginia State line is crossed in 23 miles via I-81 north. Photo taken 08/06/13. 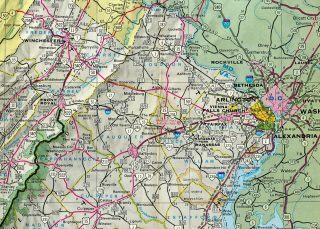 I-66 extends 64 miles west from the Capital Beltway / Interstate 495 to I-81. The freeway concludes 16 miles south of Winchester and 23 miles from the West Virginia state line along I-81. Photo taken 08/06/13. Traffic partitions for Exit 1A north to Martinsburg, West Virginia and Hagerstown, Maryland and Exit 1B for Harrisonburg, Staunton, Roanoke. Photo taken 08/06/13. The exit for I-66 east from Interstate 81 south departs from the left. The town of Front Royal lies nine miles to the southeast. Interstate 81 continues southwest along the Appalachian Mountains another 158 miles to the city of Roanoke. Photo taken 12/30/08. More photos covering I-81 south at I-66 east posted at Interstate 81 South – Frederick & Warren Counties on AARoads. The first sign for Interstate 66 east to Washington along I-81 north precedes the Exit 298 for U.S. 11 into the town of Strasburg. Photo taken 09/23/14. Interstate 81 spans Cedar Creek and enters Frederick County on the one mile approach to Exit 300 with Interstate 66. A three-wye interchange joins the two freeways just east of parallel U.S. 11. Photo taken 09/23/14. Exit 300 leaves I-81 north for Interstate 66 east to Washington. The first exit lies six miles ahead with U.S. 522 on the north side of Front Royal. Photo taken 09/23/14. 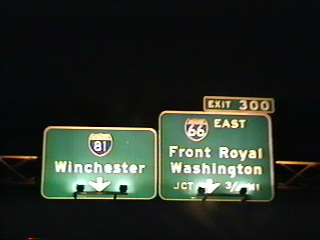 Older guide signs for I-81 north at I-66 simply referenced Winchester with no mention of North. These were replaced by the 2000s. Vidcap taken 05/27/95. 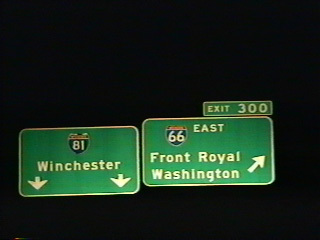 An older guide sign again for I-81 north at Exit 300 for I-66 east. The 6.6-mile stretch of Interstate 66 east from here to U.S. 340 & 522 opened in October 1971.3 Vidcap taken 05/27/95. “Running Room on I-66.” The Washington Post, September 8, 2003. Interstate 66 in Virginia, Roads to the Future (Scott Kozel). Interstate 66 and Metrorail Vienna Route, Roads to the Future (Scott Kozel). Page updated September 28, 2018.